The concepts that govern our thought are not just matters of the intellect. They also govern our everyday functioning, down to the most mundane details. Our concepts structure what we perceive, how we get around in the world, and how relate to other people. Our conceptual system thus plays a central role in defining our everyday realities. If we are right in suggesting that our conceptual system is largely metaphorical, then the way we think, what we experience, and we do every day is very much a matter of metaphor. I discovered Gareth Morgan’s book, Images of Organization, on Venkat Rao’s reading list. In the text, Morgan thoroughly explores many possible metaphors through which to understand the workings of a company. For example, companies can be thought of as machines, organisms, brains, or cultures. As a product developer, I’m always searching for frameworks to provide meaning and direction for my work. In this regard, each metaphor Morgan discusses is a goldmine capable of inspiring product vision, mission statements, and roadmaps. It is often the circumstances around a company that dictate the applicability of one metaphoric lens over another. For example, when the environment around an organization is static, the machine-like elements of a company pop to the foreground. When interactions with the outside world are predictable, corporations can create formulaic routines for optimizing their internal behavior. 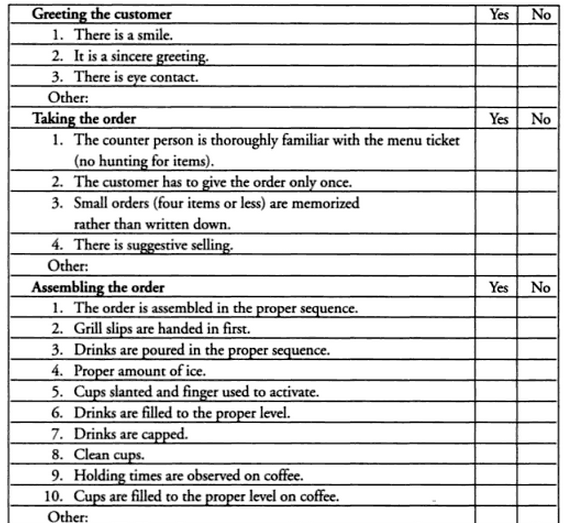 For example, from Morgan’s book, the below performance checklist applied to workers at a fast food restaurant demonstrates how even human interactions can be assessed in a binary machine-like manner. Within a mechanical operation, each employee is thought of like an interchangeable part. You might need some spare parts floating around, but for the most part, when someone leaves, a new worker can be be plugged in with minimal interruption to the system as a whole. While there can be harmful effects on the humans involved, in the right circumstances companies can achieve business success through emulating machines. The uncertainty inherent in how internal changes propagate through networks. When you do create a piece of software that clicks with its users, business success is dependent on the ability for the user base to scale to a sufficient number of paying customers. Successful growth tactics are difficult to predict in advance. When developing marketing avenues or viral mechanics, extensive tinkering is necessary to discover messages that stick and spread. As explored in Malcolm Gladwell’s The Tipping Point, seemingly trivial changes can be the difference between virality and insignificance. Organizations aspiring to operate like machines involve centralized management creating fixed recipes to dictate the behavior of front-line employees. Due to the environment of uncertainty inherent in the internet, such an approach has become futile. A centralized management team, removed from the front lines, does not know what will make a sustainably successful web site, app, or marketing approach. Instead, the contributors in the trenches must be valued, not as interchangeable parts, but as indispensable sources of knowledge and ideas. 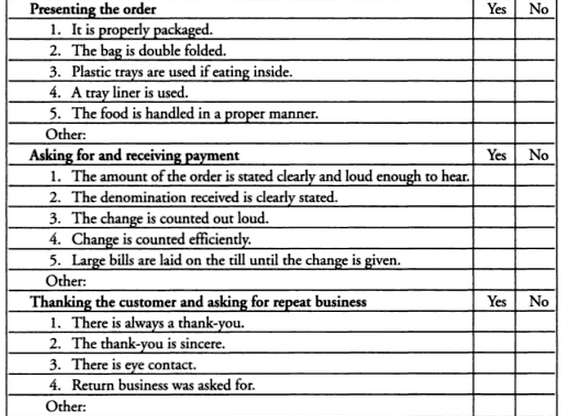 … when we pick up an object from a table we typically assume that our hands, guided by our eyes, move directly toward the object. Cybernetics suggests not. This action occurs through a process a process of error elimination, whereby deviations between hand and object are reduced at every stage of the process, so that in the end no error remains. We pick up the object by avoiding not picking it up. 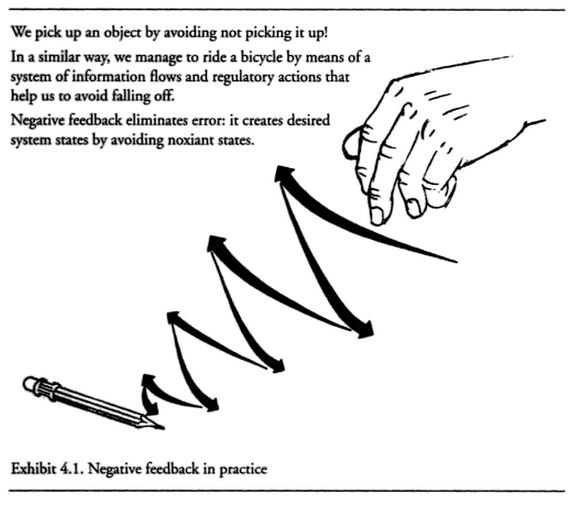 Many of today’s product development techniques mirror the brain’s pattern of repeated adjustment based on feedback from the external world. In agile software development, projects are broken down into small iterations such that the course can be readily adjusted as new information is uncovered. With lean startup methodology, teams create “hypotheses” for how to effectively reach their objectives and run experiments to cheaply validate or invalidate their hypotheses before excessive time and resources are invested. Modern teams strive to rapidly move through build-measure-learn loops. In the human brain we find this redundancy in the vast networks of connectivity through which each neuron, or nerve cell, is connected with thousands upon thousands of others. This enormous capacity generates considerable evolutionary potential. It allows vast amounts of information process from which thousands of potential patterns of development can emerge, contributing to the brain’s constantly evolving structure, refinement, and intelligence. A clear example is pair programming, that is, having two engineers simultaneously work on the same task. On the surface, spending two resources on a task instead of one might seem economically wasteful. It’s unclear whether it makes task completion take shorter or longer. But teams have found that pairs, compared to individuals, produce cleaner, more maintainable code with less defects. Furthermore, pair programming prevents critical knowledge from getting isolated within one person’s mind. When only one team member has deep knowledge of an area of the code base, the team becomes vulnerable when the business requires more changes in that area. The one person with specialized knowledge may be absent or stretched thin between other responsibilities. Pairing is a key ingredient in keeping knowledge flowing through an engineering team. Flexibility, quality, creativity, and efficiency are maximized when all engineers are capable of working in all areas of the code base. Hence, the popularity of the job title “Full Stack Developer” where engineering expertise, instead of being divided according to layers of the software (e.g., front-end versus back-end), are duplicated across many developers. In my article, The Three Types of Product Builders, I take things one step further by arguing for the importance of individuals who are proficient in all of the primary areas of building a company; technology, design, and business strategy. When more of a company’s contributors are able to understand the full picture across all traditional job functions, the company has increased their ability to quickly adapt to changing circumstances. Teams that employ redundancy understand the value of learning and strive to avoid the predicament of trapping knowledge in the minds of few. Furthermore, they recognize that their assumptions about how to reach objectives are only hypotheses that need to be examined and tested. Creating redundancy is a key technique in discovering and spreading surprising, counter-intuitive knowledge about what works and what doesn’t. 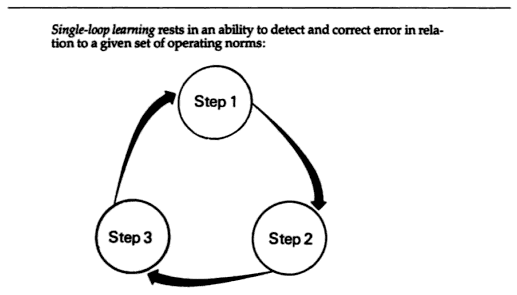 … More complex cybernetic systems, such as the human brain or advanced computers, have the capacity … to detect and correct errors in operating norms, thereby influencing the standards that guide their detailed operations. It is this self-questioning ability that underpins the activities of systems that are able to learn to learn and self-organize. The essential difference between these two types of learning is identified in terms of a distinction between “single-loop” and “double-loop” learning. We see some of today’s product development teams embracing double-loop learning. In agile software development, teams routinely question their own operating norms in the form of project “retrospectives.” In retrospectives, teams ask themselves the question, “What’s going well or not well in our current process? How should our process change next time?” Retrospectives allow organizations to identify and correct pathologies in their alignment. 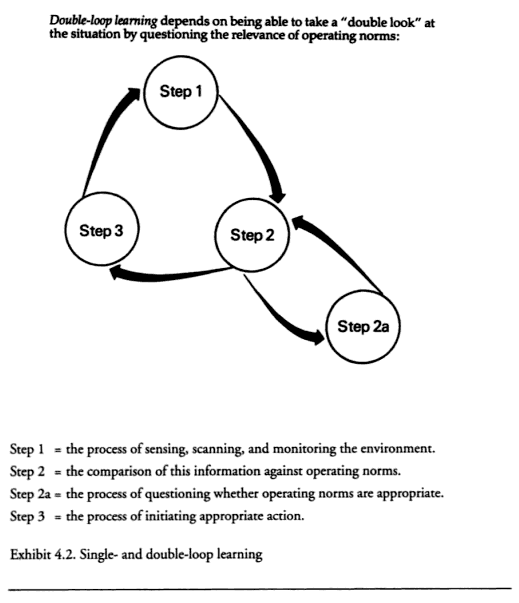 Perhaps the most iconic embodiment of double-loop learning is “the pivot.” Lean startup teams iteratively formulate and test hypotheses for how to achieve company objectives. After a hypotheses fails, sophisticated teams don’t blindly move on to the next tactic. Instead, they question whether their overall objective is tenable. When a larger strategic direction is deemed a failure, companies pivot to a new direction. Many of today’s most successful companies pivoted before landing on a winning proposition. Without double-loop learning, they would no longer be in business. There are two main types of amnesia: retrograde amnesia and anterograde amnesia. Retrograde amnesia is the inability to retrieve information that was acquired before a particular date, usually the date of an accident or operation. In some cases the memory loss can extend back decades, while in others the person may lose only a few months of memory. Anterograde amnesia is the inability to transfer new information from the short-term store into the long-term store. People with this type of amnesia cannot remember things for long periods of time. Retrograde amnesia occurs in organizations when previous employees do not pass on their knowledge when they depart. In software development, it can take years of experience crafting a product to develop a sufficiently nuanced understanding of what works and what doesn’t. When the people with direct experience of previous launches leave, the new people that take over have to start from almost zero in building their understanding of the product. The problem is only exacerbated with increases to labor market flexibility. In tech we’re seeing trends in people holding a position for less than a couple years before moving to the next opportunity. While this practice may benefit the individuals, organizations can struggle when accumulated knowledge repeatedly walks out he door. While individuals working on a product over a period time acquire valuable knowledge, the new information they discover is commonly not transferred to long-term memory that is actionable to the whole organization. If you compare an organization to a brain, this form of failed memory transfer is akin to anterograde amnesia. Consequently we see teams failing to apply lessons learned by other teams, we see managers failing to adjust strategy when new information comes in from the front lines, and we see individual contributors fail to change their tactics when company leadership uncovers a change to the overall business landscape. While companies try to combat amnesia through knowledge management solutions like intranets and wikis, these solutions are too manual to comprehensively keep up and are subject to future misinterpretations. I liken today’s organizations to the amnesiac main character in the film Memento. To solve the murder of his wife, he tries compensate for his amnesia by tattooing clues for his future self all over his body. These “clues” lead him to pursue the wrong suspect. Holography uses lensless cameras to record information in a way that stores the whole in all of the parts. One of the interesting features is that, if the holographic plate recording the information is broken, any single piece can be used to reconstruct the entire image. Everything is enfolded in everything else, just as if we were able to throw a pebble into a pond and see the whole pond and all the waves, ripples, and drops of water generated by the splash in each and every one of the drops of water. Holography demonstrates that it is possible to create processes where the whole can be encoded in all of the parts so that each and every part represents the whole. Neuroscientist Karl Pribram has suggested that the the brain functions in the accordance with holographic principles: that memory is distributed throughout the brain and therefore can be reconstituted from any of the parts. If he is correct, this may explain why the rats in Karl Lashley’s experiments were able to function reasonably well even when major portions of their brain had been removed. This paradox is clearly illustrated in the results of “split brain” research, which shows how the brain’s right hemisphere plays a dominant role in creative, intuitive, emotional, acoustic, and pattern recognition functions and controls the left side of the body. The left hemisphere is more involved with rational, analytic, reductive, linguistic, visual, and verbal functions while controlling the right side of the body. The is undoubtedly a high degree of specialization on the part of each hemisphere, but both are always involved in any given activity. It is just that one hemisphere seems to be more active or dominant than the other as different functions are brought into play. Traditional organizations are attracted to the “specialized” side of the holographic/specialized paradox while neglecting the “holographic” side. We see commonly see companies organized into groups according to their preconceived, narrow job responsibility; engineering, marketing, design, sales, etc.. As Venkat Rao explains in his essay The Amazing, Shrinking Org Chart, the classic org chart model is becoming deficient as preconceived structures fail to keep up with a dynamically changing environment. Rao argues that tools like Slack demonstrate a new way for companies to organize around order that emerges naturally out of the actual work being done. By using Slack, a team increases their ability to achieve a balance between holographic and specialized functioning. Slack makes it easier for each of an organization’s employees to dip into the river of what others are working on. While there are promising tools and new organizational design philosophies like holacracy, most companies have not broken free from machine-like ways of operating. When comparing the operations of product development teams to the workings of the brain, we find areas where organizations are severely limited. However, each limitation we identify provides a clearly delineated opportunity for improvement. The brain serves as a model that the product development community can aspire to recreate if they want to maximize their learning potential. Personally, I’ve found the brain to be an inspiring north star for product ideas. My project, DoubleLoop, aspires to cure organizational amnesia through recording a history of a company’s past website launches, striving to dramatically shorten the time required for an organization to discover and capitalize on opportunities moving forward. As product developers, we’ve only begun to learn how to learn. I expect we’re going to continue to see a new era of tools, organizing principles, and product development methodologies that will bring our operations closer to that of the brain. If you’re looking for product vision, look inward.